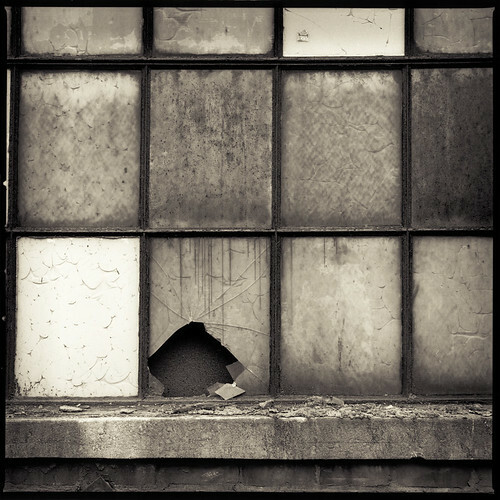 Broken Window, originally uploaded by smooveb. I’m in an emotional fog right now, and it is easy to assume this is because of The Virgin Suicides by Jeffrey Eugenides. It is an odd book. It is about a community – a block really – the families, the gossip, The Lisbon Girls and the boys who watched them. It was an odd book in structure alone. Two weeks of reading, and I look down thinking What? Only page 144? and by 5 pm today, I was done. It wasn’t slow by any means, just… strolling, if reading may do so. You get to know the Lisbon girls curiously, intimately, as the boys do: through things seen between curtains, memories pieced together by the crowd, knick-knacks noticed while passing bedrooms, invading bathroom cupboards. You feel for them, but know not what they’re feeling. You are a fly on the wall at dances, parties, acts witnessed in the dark. You can’t forget the Lisbon girls once they’re dead: you fall in love with them, their chains, and their mystery just as much as the boys did – do. You choose to acknowledge and proceed to ignore the same conclusion your peers have come to: “They were bound for college, husbands, child-rearing, unhappiness only dimly perceived – bound, in other words, for life.” You feel bound too, and admire Cecilia, Lux, Bonnie, Mary and Therese for having the courage to escape. In only 250 pages you age a hundred years. Dear reader, you grow to know these girls better than you know your own family. The boys piece it all together for you. So let the girls leave, one by one, and don’t feel sad. You knew they were too good, too pure, too knowing for us when they got here.